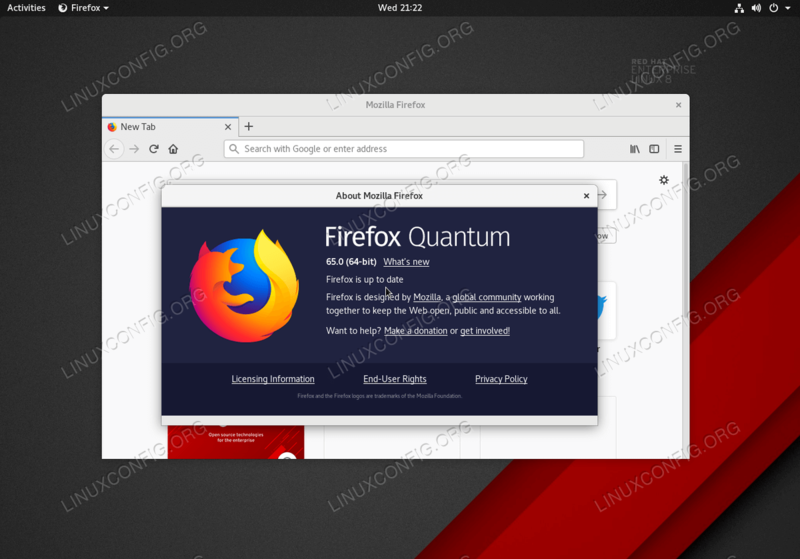 The Firefox comes pre-installed on Red Hat Enterprise Linux 8 as part of RHEL 8 Workstation. In this tutorial you will learn how to install a latest Firefox browser directly from Mozilla repository. Download and extract the latest Firefox browser. This step is optional but highly recommended in case you might wish to revert to Redhat stock Firefox version. Create a symlink to a newly downloaded /usr/local/firefox/firefox executable. Start the latest Firefox browser from GUI menu or by executing the firefox command. Note if you need to upgrade your Firefox browser once again simply execute the download and extract command as part fo the Step 1.